Now here’s the deal: I’ll give you some tips and the obligatory classic quote from a crusty New Englander, but I’ll also tell you the truth about stacking firewood. 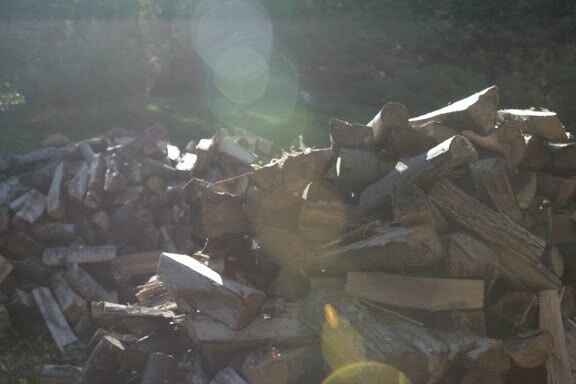 In Walden, Henry David Thoreau said, “Every man looks at his woodpile with a kind of affection.” I’ve been stacking cordwood for the last forty autumns, and to tell the truth, it isn’t my favorite part of heating with wood. And bucking is real work. But nobody in my family really likes to stack wood. They say confession is good for the soul, but this admission just makes me depressed. But you can’t live on the sawtoothed ragged edge forever, and nothing is worse than digging through the depth of snow and the layers of ice to free up some frozen firewood, so okay, okay, let’s stack some cordwood. First: use the right wood. What we want is hardwood — not trees with needles or cottonwood or other types of poplar, if you can help it. Confused? Sugar, which holds 33 percent more heat, is likely to have shaggy bark and yellow or orange leaves in the fall. Red maple has, well, red leaves and red twigs, too. Wood should be at least a year old, meaning the tree was felled and the wood split last fall or before. This winter we are going to burn two-year-old wood. It is a luxury to be this far ahead, but the luxury came from many hours with saw, maul, and pickup truck. It is about half the weight of fresh-cut wood. It has cracks, called “checks,” in the face of the sawn ends. When you smack two pieces together, they should not “thud”; they should ring like two baseball bats. Smell: green wood, especially oak, is much more pungent than dry stuff. This may seem to be an obvious caution, but make sure that the wood is not too long for your stove. This is particularly important if you are buying truckloads of the stuff. When the firewood guy tells you what lengths he is selling, don’t guess and don’t try to remember — measure your stove. The three basics are off the ground, under cover, and safe. The goal is to keep the wood dry, with air circulating through the pile. So if you can’t keep your wood indoors, put a tarp or some old sheet-metal roofing on top. If you use a tarp, cover the top of the pile only. Many is the newcomer to the country who has wrapped his or her woodpile up tight as a tick in plastic, and great is their dismay when the wood is dripping wet from condensation. The wood's like you: it’s gotta breathe. Off the wet ground is good, too. If you can stack on top of wood pallets, that’s fine. Otherwise “stringers” work well; stringers are two boards or saplings laid out parallel to each other and closer together than the piles of firewood are long. You lay the firewood across the stringers, which boost the wood off the ground, encouraging that vital circulation of air. For the same reason don’t obsess about stacking perfectly tight. You want to be able to see a little bit of daylight through the pile. Mark Twain wrote about some wood dealers, “Those crooks had it stacked so you could throw a dog through it anywhere.’’ That’s a little too loose. Finally, safety: the woodpile should not fall on you. Keep it level, and brace the ends. 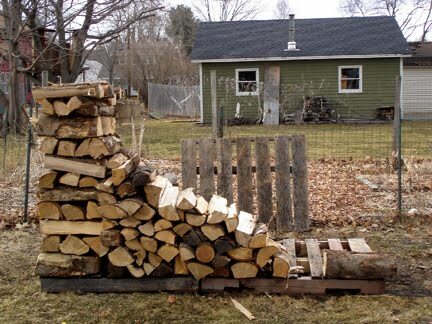 If possible, build your woodpile against a post, a tree, or something else vertical and strong. If none is available, you’ll have to “crib” the ends. Cribbing is making a freestanding tower of wood at the end of the row by alternating the directions of the layers of wood. The first layer is placed at right angles to the direction of the row; the next layer in the same direction as the pile; the third layer at right angles, and so on. Cribbing will steady the pile surprisingly well. To diminish the risk of avalanche, it is important not to stack too high. Of course, the more convenient to the stove or fireplace (but at least 3 feet away!) the better. This backyard woodpile uses old pallets in lieu of stringers. At the right end of the stack, a new course of cribbing is being started. Photo by Ilona Sherratt from The Backyard Lumberjack. All this talk about woodpiles has made me feel better about the process. When the large is too huge, the small too sharp, or the eternal too damn long, it is good to pick up sticks. We have found old maple spouts from sugaring, cherry pits stored by chipmunks, and skins shed by garter snakes in our woodpiles. What about a pot of gold, you ask? That’s the woodpile. By February you’ll understand. Farmer, poet, shepherd, and minister, Stephen Philbrick has cut down thousands of trees and stacked hundreds of cords of wood. He still has all his digits but does have a gouge in his leg that taught him an invaluable lesson: Never leave home without your chaps! The author of The Backyard Lumberjack and three published books of poetry, Stephen is a graduate of Brown University and minister of West Cummington Congregational Church. He lives in western Massachusetts, where he manages 120 acres of woodland. Top photo by Melanie Jolicoeur. That's my woodpile you feature in this posting. I VERY MUCH like to stack wood, but hate everything else about the wood cutting business. I took the photo in my yard in late March. By that time the other 5 stacked cords were long gone. I always use cribbing and never "cheat" by driving poles into the ground at the ends of my woodpiles to steady them. My piles never fall down. And those are my piles, waiting to be stacked!